1. Bear Grass can give you paper cuts if you run your hand along it's edges. I get one almost every time I use it. Don't tell anyone. 2. 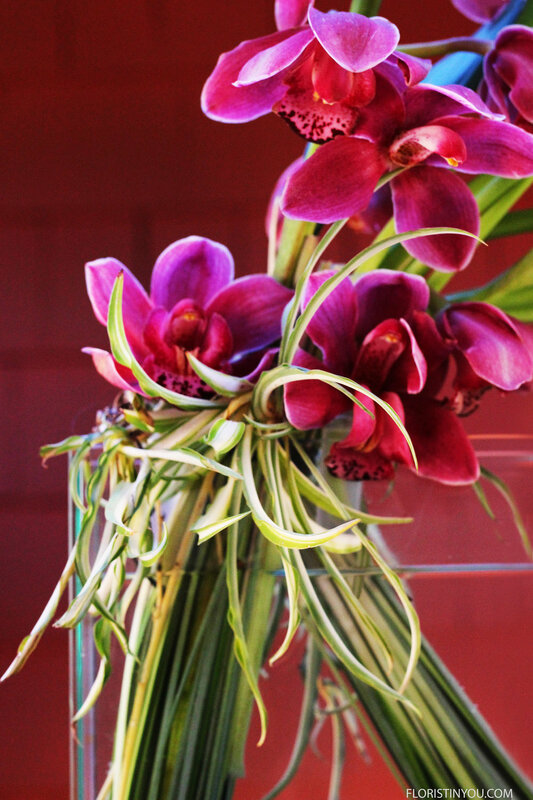 When you bind the flowers inside the top of the Bear Grass, this must be done with the flowers in the vase or you will pop the centers off the cymbidium blooms. Oh no. I've never done that. 3. Get your flowers in exactly the position you want them in before binding them. You can not adjust them after binding. Oh no, I've never done that either. 4. 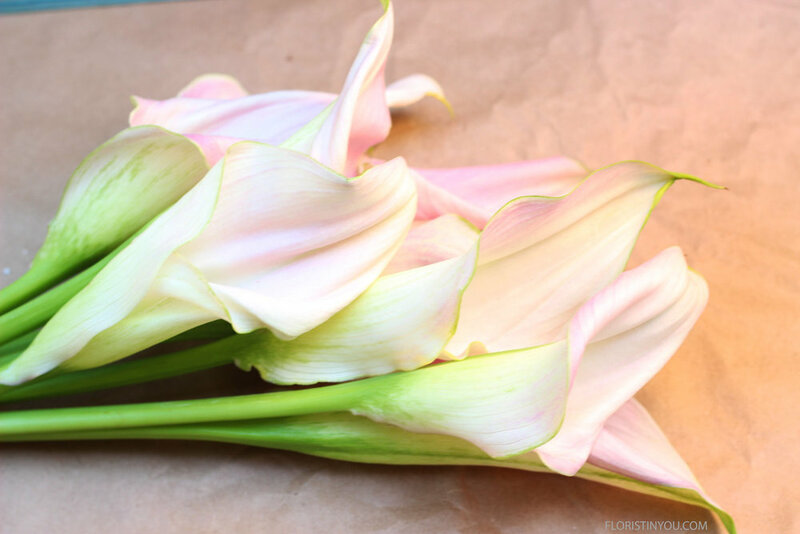 The stems of the Calla Lilies break easily. I may have done that once. 5. 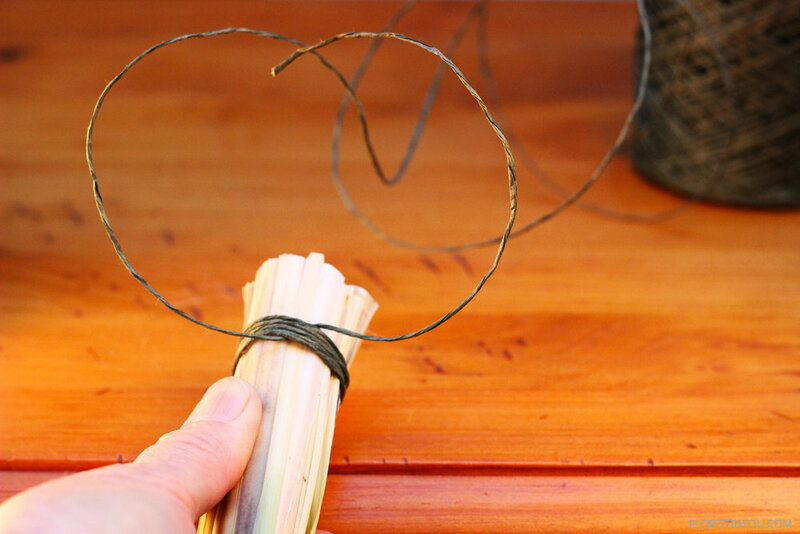 When wrapping the bindwire around the Bear Grass, leave 2 loose ends that you can double knot. (Don't be tempted to simply twist the pieces of bindwire together. It won't hold.) Take my word for it. OK. Now that I've scared you to death, if you have your supplies and extra pair of hands, let's begin. Here are your flowers and your vase. Bindwire by Oasis. You will need sharp pruning sheers (red handles above) for the Calla. 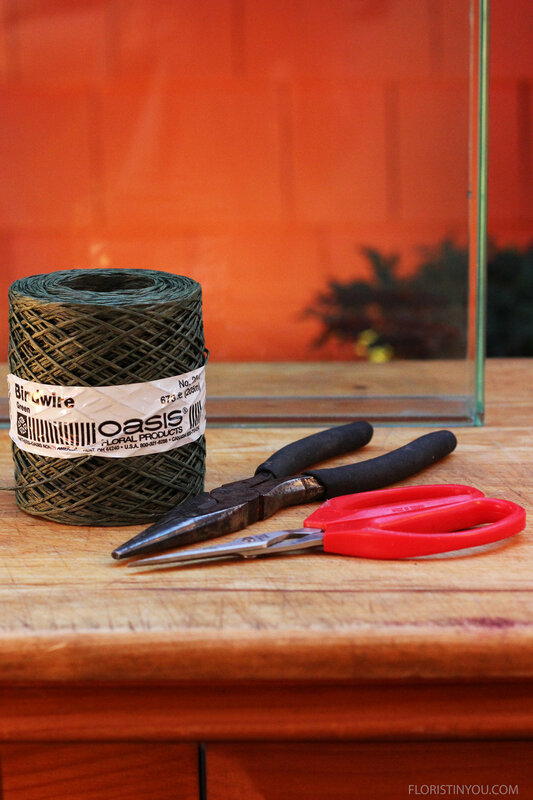 These heavy duty scissors (from the 99 cent store) easily cut the bindwire. Remove short pieces of grass. Keep the grass that's 28-30 inches long. Divide it in half. Bring tips grass into heart shape. Bind leaving 1.5 inch loose end. Wrap once. Pull tight and double knot. Wrap 3 more times. Pull tight. Double knot. Wrap ends around. Trim ends grass. Arrange Calla Lilies so they extend out to the right, like so. Cut 4 medium Spider Plants with runners stems on. Leave stems about 4 inches long. Pull back grass on left end at the top, and insert tulips inside top end of grass. Replace grass back over ends of Calla Lilies. Insert Cymbidium into Bear Grass behind Calla Lilies. Tie bindwire around left side grass. Double knot. Go around 3 more times. Double knot. Tie around right side grass. Pull tight. Double knot. Trim. Right side will be about 26". Then wrap around 3 or 4 times. Double knot. Leave ends to attach Spider plants. Slip 1 1/2 yards of wire under the wrapped wire, leaving a 3 inch end. With that, tie left grass to right grass ends. Double knot. Leave wire ends in front. Wrap around front & back of grass ends 4 times. Double knot. Trim grass. Tie yellow feeder stems of 2 Spider Plants in front, 2 in back with ends of wires that are left. You are finished. Congrats and enjoy! Happy Valentine's.